In conjunction with the Tucson Glass Festival, the University of Arizona Museum of Art presents an exhibition of the work of Mexican artist Ana Thiel. The exhibition, Ana Thiel: Layers of Being – A Thirty Year Retrospective is not your typical retrospective. It will be presented in three countries: Mexico, United States and Belgium and is being presented consecutively from October 2010 to September 2011. The first of the series was presented in Guanajuato, Mexico at the Institute of Fine Arts of San Miguel de Allende in October 2010. Tucson is proud to be the U.S. venue; the final installment will be at the Université Libre in Brussels in September 2011. Each location features different aspects of the artist’s work. ‘What is constant is the sense of exploration, the connection to nature, and a poetic inspiration’ that Ana Thiel brings to her art. The internationally known sculptor, who lives in San Miguel de Allende, creates mixed media sculptures combining hot cast glass with discarded and found objects. She scavenges the regions in which she works for old furniture, machine parts, metal, weathered wood and other materials, and then combines these objects with molten glass to create a narrative linking the past with the present. Thiel has traveled the world studying sculpture and glass techniques, including residencies in Spain, Japan and the United States. 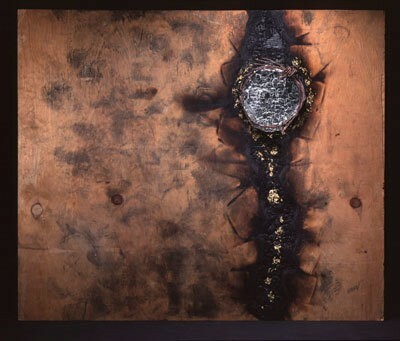 Her work has been exhibited in Mexico, the USA and various countries in Europe, Asia, Central and South America and is represented in many important public and private international collections. Ana Thiel: Layers of Being – A Thirty Year Retrospective is UAMA’s contribution to Tucson’s city-wide celebration of glass. This spring fifteen galleries and two museums are presenting glass-related exhibitions. The Tucson Glass Festival, sponsored by the Sonoran Art Foundation in conjunction with Tom Philabaum of Philabaum Glass Gallery, will feature a weekend of glass blowing and flame work demonstration and activities on April 8th, 9th, & 10th. More information about the Festival and the glass exhibitions can be found at www.sonoranglass.org. Ana Thiel: Layers of Being – A Thirty Year Retrospective has been generously supported by a grant from the Art Alliance for Contemporary Glass, a national not-for-profit organization whose mission is to further the development and appreciation of art made from glass; additional support comes from Pima County, FedEx, Sonoran Glass Art Academy and Philabaum Glass Gallery.